I came to Japan for the first time in October of 1962. In June of 1963, I was really suffering from the heat and humidity of Tokyo, especially at my training sessions at the JKA (Nippon Karate Kyokai) main dojo in Yotsuya, Tokyo. That is no small wonder, having been raised in Britain and having previously spent four summers in the Canadian arctic. Some of my Karate sempai, who had been taking me into the mountains since the previous winter, promised to take me to a ‘cool place.’ We met at Ueno station late on a Friday evening. We went by train, changing trains, and in the early morning we disembarked. Wracking my brains over the years, I think that our destination must have been Iiyama, Nagano. We walked for a long, long time, under burning sun (the summer sun in Japan is much higher in the sky than it is in Britain or the arctic) and, to me anyway, sweltering heat. Finally at an elevation above sea level of about 1000 metres, we entered a magical, mystical world. The air was cool and delicious, with a gentle breeze. Sunlight filtering through young leaves was far more vivid and beautiful than the stained glass of any grand cathedral. The tall, broad, fluted trunks of trees, gentle grey in colour and patterned with pastel shades of green and yellow lichens reminded me, but surpassed in grace and beauty, the great stone pillars of western churches. From every direction came the sound of sweet, cold, crystal-clear running water. This was an ancient beech forest. I had known beech trees in Britain since I was a child. 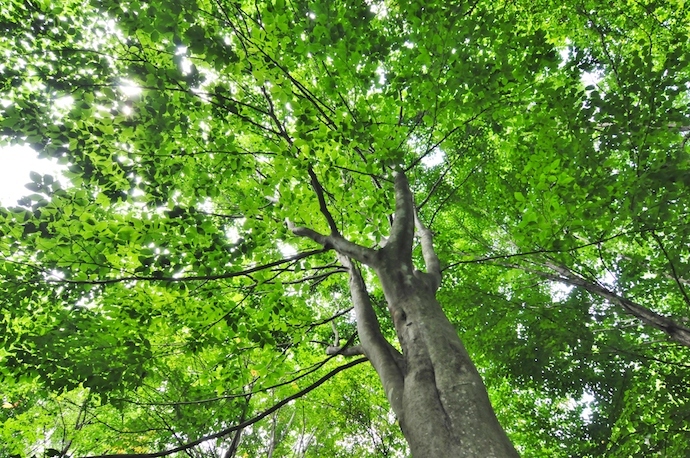 However, the beech trees and groves I had played in were all planted by humans. This was an ancient, natural beech forest, and the first in my experience. From that day on my life has been filled with a love and wonder of Japan’s forests, mountains and natural streams. There are two species of Japanese beech; ‘Buna’ or ‘Siebold’s beech – Fagus crenata, and ‘Japanese blue beech, ‘Inubuna- – Fagus Japonica. They prefer well-drained, loamy soils. They grow to a height of 35 metres. The seeds, or ‘mast’ are angular brown nuts, encased in a prickly case. They are highly edible for humans, bears, squirrels and other wildlife. 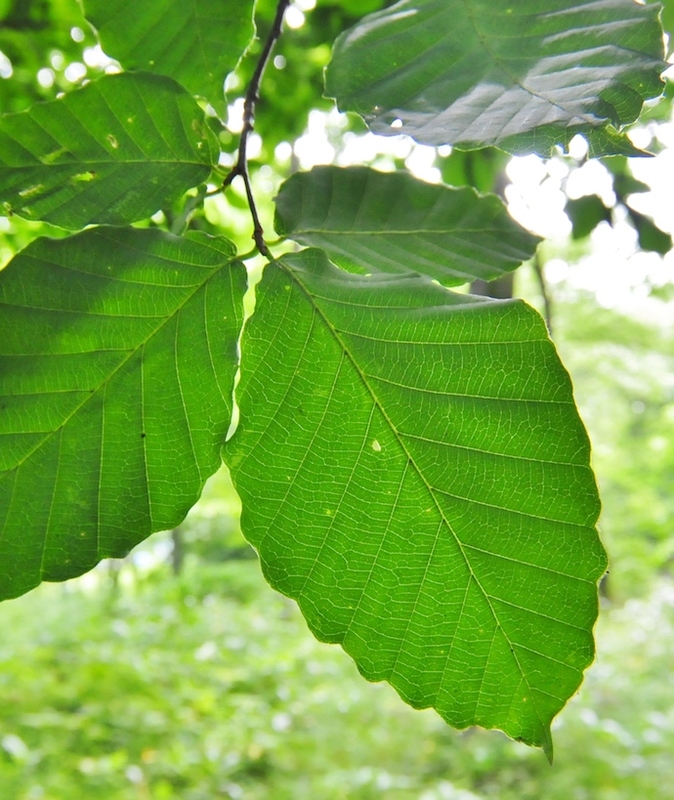 Beech shoots and very young leaves are also edible and excellent in salads. 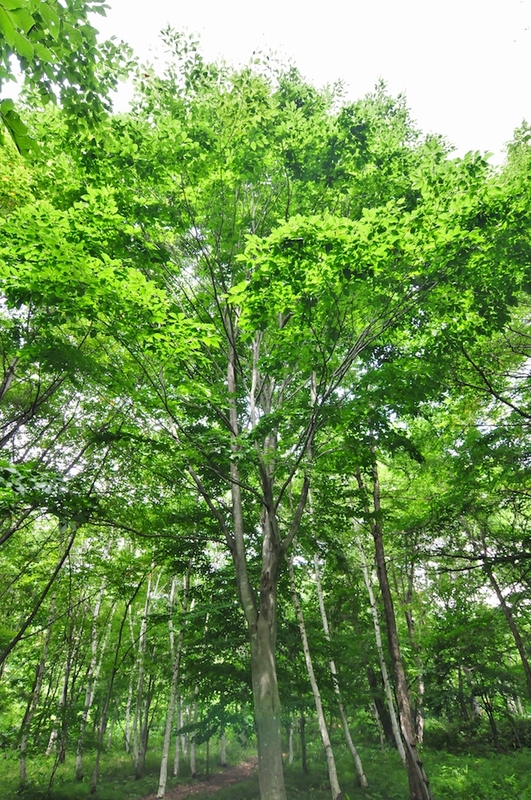 Contrary to a widespread belief in Japan, the beech is not a ‘useless tree.’ In Europe and North America the timber is highly prized for indoor furniture and flooring, and is also widely used in Japan for bowls and so forth. Odorless beech wood is very absorbent, which is why it is not good for outdoors, kitchens or bathrooms. However, it is excellent for living rooms, studies, bedroom, dressers and so forth. We have been bringing back beech trees to our Afan woods for the last thirty years and they take a long time to grow. Five minutes with a chainsaw can destroy 300 years of invaluable life and service to nature.